Teeth Whitening « Oceandent | Dental Pattaya & Jomtien. Teeth whitening can be performed either at-home or in the dentist’s office. With both whitening techniques, we guarantee your highest satisfaction that will help brighten your white smile by many shades. This is dependant upon your teeth being suitable for whitening which your Dentist will discuss this with you at your free initial consultation. You can achieve a whiter smile in one hour by dentist at our office with cool light machine, effective whitening gel and safe guard procedure. 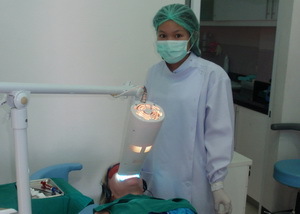 Individualized instruction on how to have your teeth whitening solution will be provided. We’ll make a model of your teeth and use that to create a customized mouth tray that fits comfortably in your mouth. 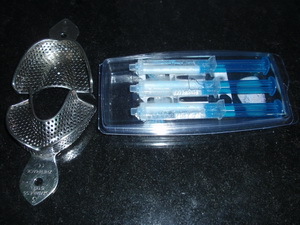 The tray will hold a mild solution of whitening gel and you can control duration of bleaching by yourself.